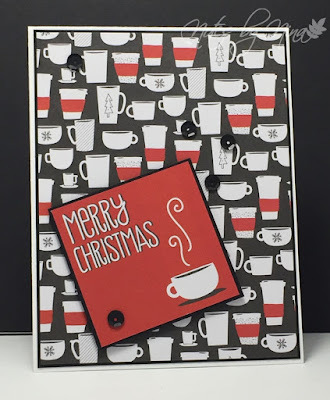 Welcome to a new Merry Monday Christmas card Challenge, Debbie is our hostess this week her challenge is to Make a Christmas card with FIVE of something on it. I chose snowflakes for my five something and I used a little emboss resist. I heat embossed the snowflakes on some watercolor paper then added background colour with Distress Inks. I used my Gansai Tambi Starry Colors set to add flicks of white gold all over the background. I did the same with the round circle but added a sentiment in black and popped it up with foam tape. I then heat embossed another sentiment in white on a scrape of blue. I finished with some gems. 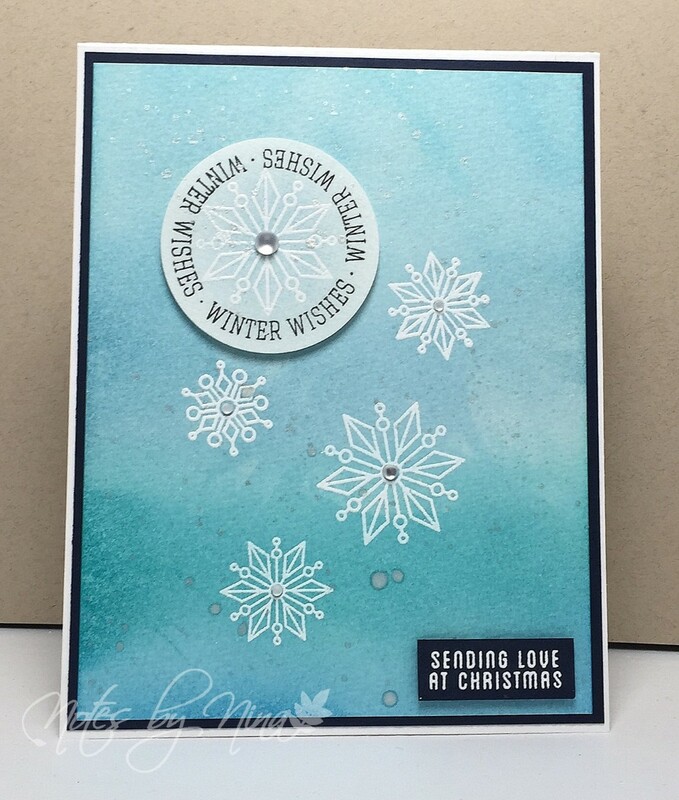 Supplies: White and blue card stock, Simon Says Stamps - Circle Saying Holiday, punch, gems. Good Evening, a quick post tonight. I am playing along with the current Muse Challenge. This is the inspiration card by Jenni Murray, its is darling. I started with some flowers but I just could not bring it together. 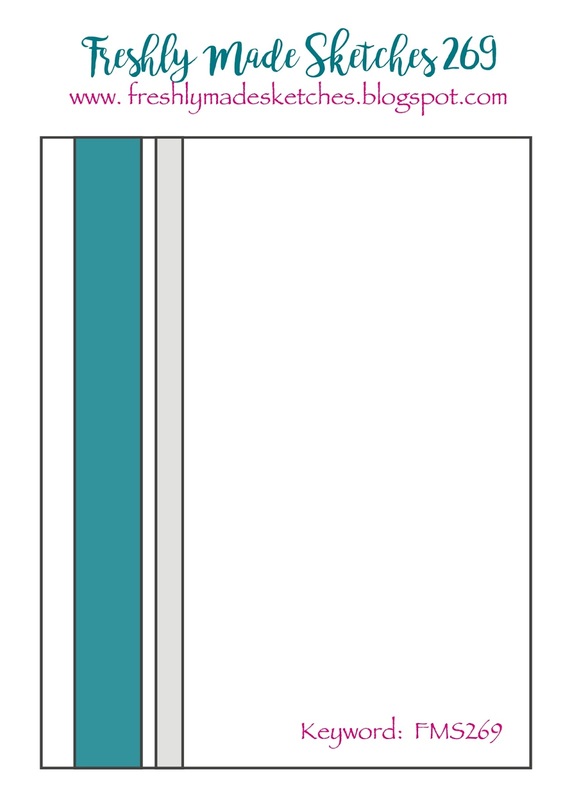 So I started over and this one was pretty quick to create using the Jenny's card like a sketch. I love this paper, it is a older pad and I will be sad when I have used up all the scraps which are all that are left. I die cut the hearts and fussy cut the sentiment and the frame is from a stitched die cut. I put all the elements together tossing in some foam tape here and there. Supplies: White card stock, Designer Paper - Echo Park, Simon Says Stamp - Stitched die cuts. 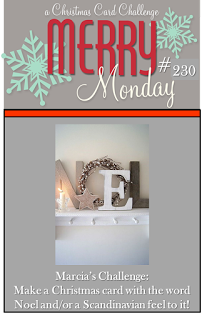 Welcome to a new Merry Monday Challenge, Deanne is our hostess this week and she has an inspiration image for this weeks challenge. 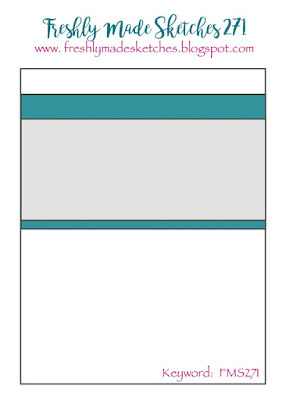 I created a CAS card for this week's challenge and why not when there are some mighty cute papers out there that take care of all the work. I added some DP to a black card stock layers. The little panel is from one of the pages, I finished with some sequins. Supplies: White and Black card stock, Designer Paper - American Crafts, sequins. 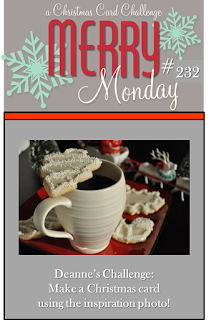 Be sure to take a peak at all the wonderful inspiration on the Merry Monday Challenge blog. Good Morning and Happy Sunday, I had a little time in my craft room yesterday. I was not feeling overly creative but was determined to at least make one card. So I decided to play along with Freshly Made Sketches. I had a handful of new craft items sitting on my desk and I made sure to pull them out. 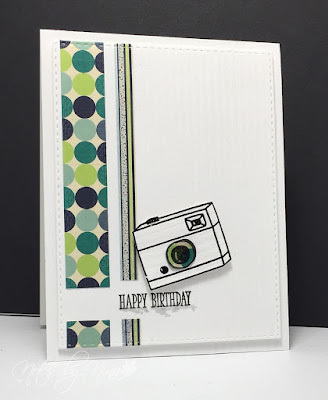 I started with some new 6x6 papers from Gina K Designers for the background. I also had new dies cuts and stamps from Simon Says Stamps featuring love. 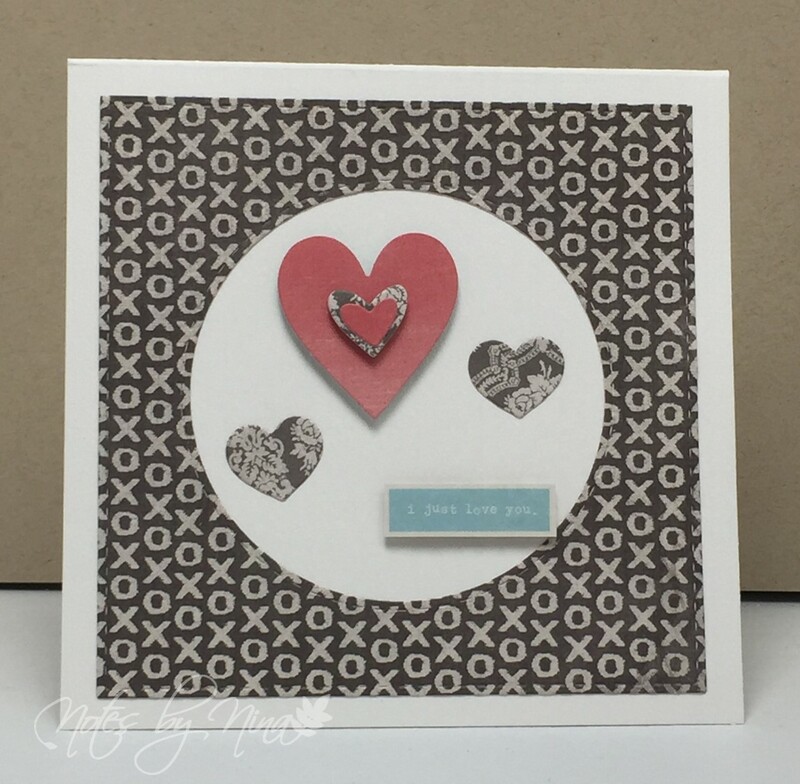 I added some layers, white, red cardstock under the vellum and added some foam tape to the hearts. 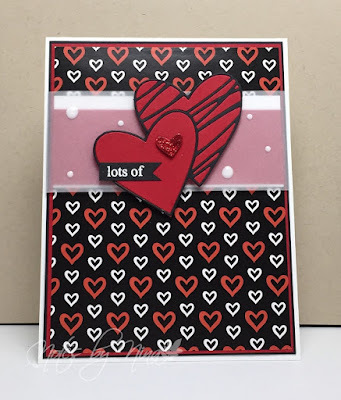 I heat embossed the sentiment and added a good layer of Stickles to the mini heart. I finished by trying out Nuvo Crystal Drops. I figured I did not to bad for a first time use. 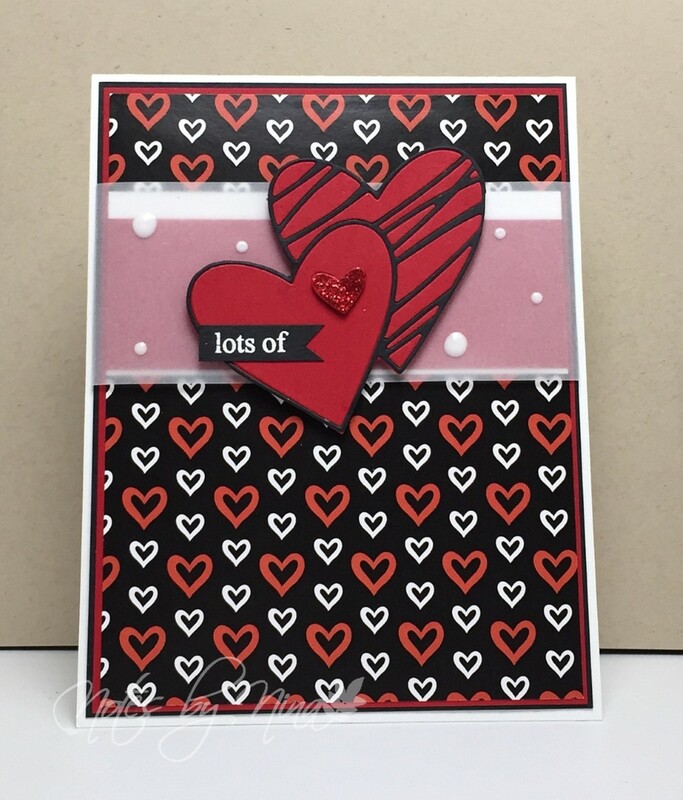 Supplies: White and red cardstock, Designer Paper - Gina K Design, Simons Says Stamps - Die cuts and stamps, Nuvo Crystal Drops, Stickles. Have a great day, I am starting of my day with a little crafting then off to a local health show. Good Morning and Merry Monday, its time for a new challenge. 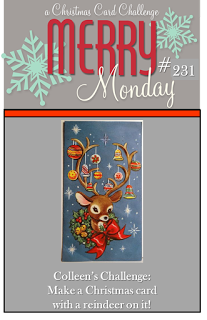 This week our hostess is Colleen and the challenge is to Make a Christmas card with a reindeer on it. 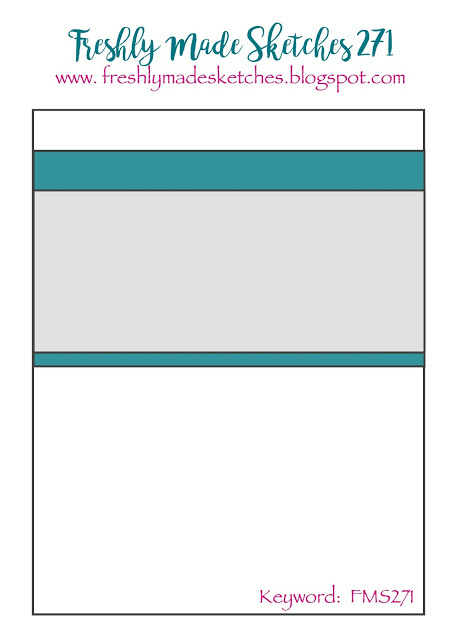 My idea for this card started out simple enough but as I created the card a different idea formed in my head. I started with the Santa and Reindeer die cut and added some snowy DP in behind. 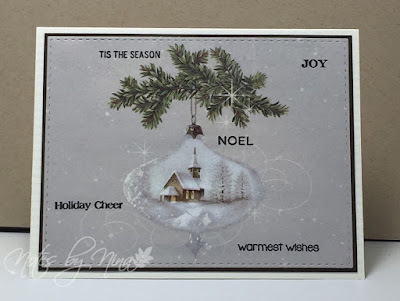 I used my misty to add the sentiment to the bottom of the white panel, then added some snowy texture with an embossing folder. 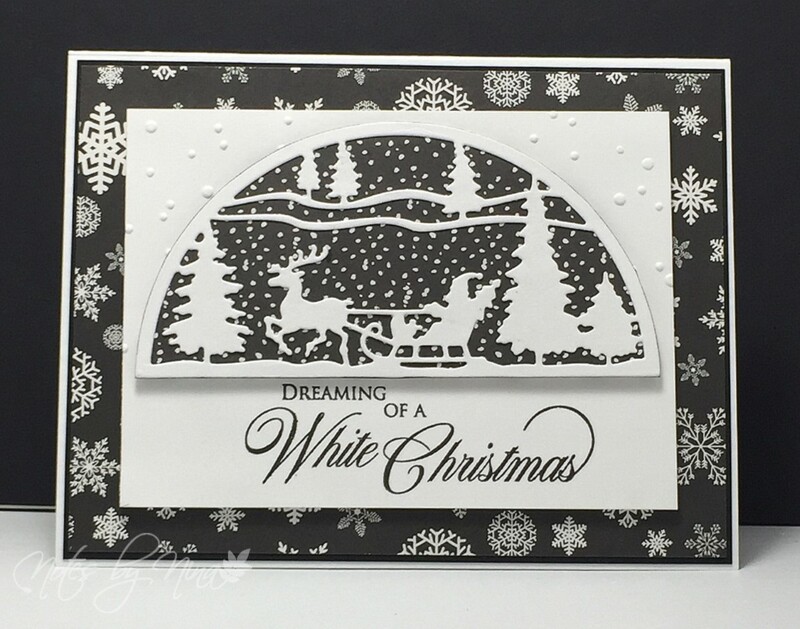 I created a bottom panel that had a different snowflake DP then finished by adding some Wink of Stella to Sleigh scene die cut. 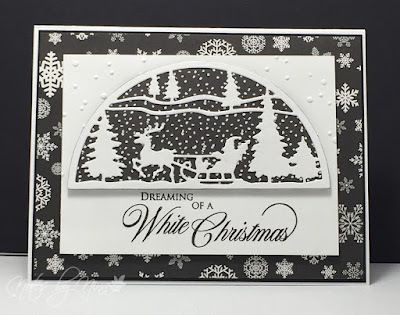 Supplies: White and black card stock, Designer Paper - Carta Bella, Penny Black - Yuletide Wishes. Well so far not so good on playing along with challenges, second week of January and I have not yet broken the spell I seem to be under of 'not enough craft time'. This very CAS card was a two session effort.. don't get me started on that ;). I picked up these adorable papers around Christmas time, I am not very good at cute cards and so I thought that these papers would help me out. These two adorable little guys were the first choice. I used my stitched squares to but out a segment of a 6 x 6 piece of DP. 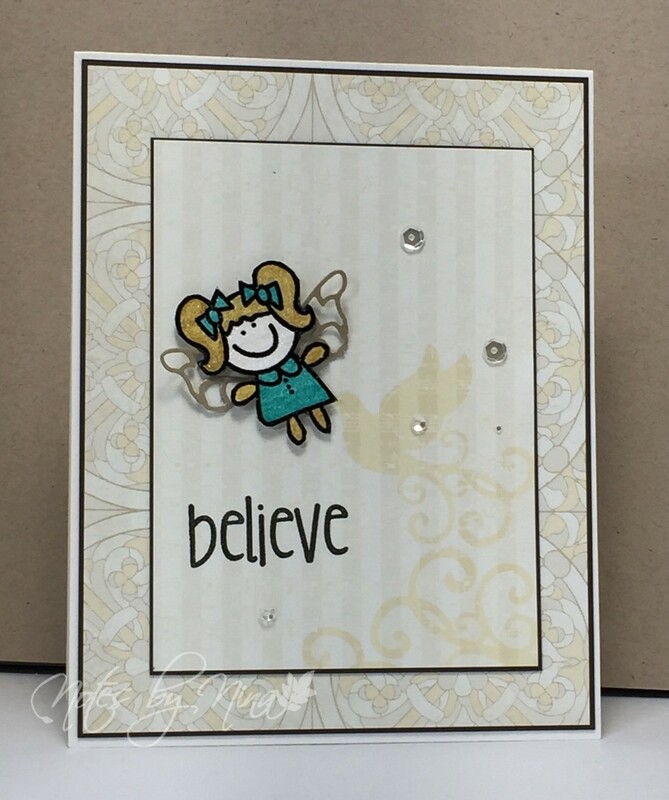 I added a thin green layer of card stock underneath then added the sentiment and some sequins. Supplies: White and green card stock, Designer Paper - Wild Rose Studio , Hero Arts - Many Everyday Messages, Sequins. 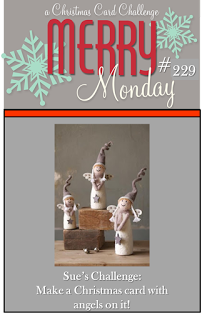 Merry Monday and welcome to a new Merry Monday Challenge, this week Marcia is our hostess this week and her challenge is to Make a Christmas card with the word Noel and/or a Scandinavian feel to it. 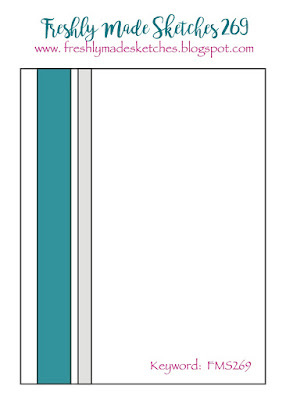 I managed to accomplish both, I have a love for Pion Designer paper which are made in Sweden. I love the beautiful designs. I purchased a few new Penny Black stamps set around Christmas that have some wonderful sentiments. 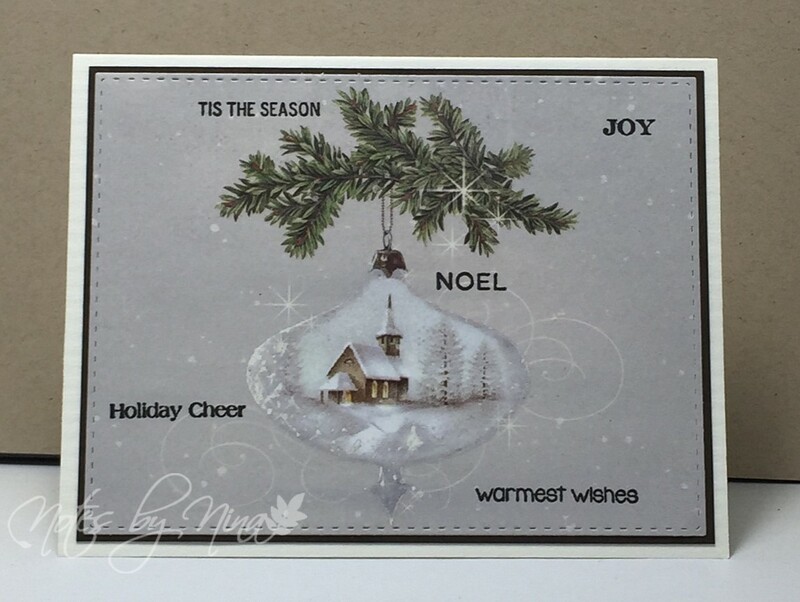 I used stitched die cuts to outline this stunning ornament with a choosy cabin. I added a number of random sentiments. I finished by using some Wink of Stella to add a little shimmer to the snow. 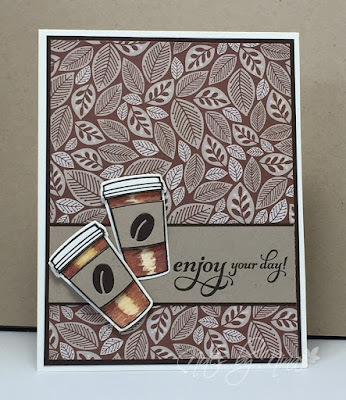 Supplies: Cream and brown card stock, Designer Paper - Pion, Penny Black - Holiday Snippets. 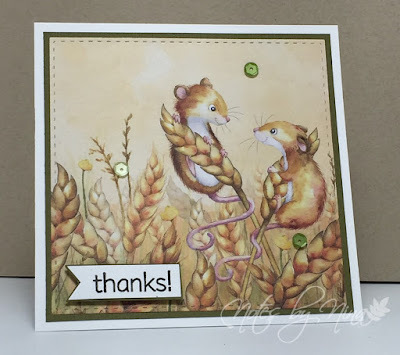 The Merry Monday Design team had som wonderful cards to share, stop by the challenge blog to take a look. I promised myself I would do more challenges this year, I love them but last year I only played along once in a while. So when I saw this fabulous CAS sketch over a Freshly Made Sketches I was determined to play along. I pulled out some fun designer papers and put this card together for my son's birthday. He has taken an interest in photography lately so I want to add this cute camera image. I added the sentiment, then a messy gray shadow. I heat embossed the camera and popped it up with foam tape. I stamped the lens on a small scrap then fussy cut it out and covered it in Glossy Accents. I finished by popping the center panel up with foam tape. Supplies: White cardstock, Designer Paper - Bo Bunny, Clearly Besotted - Many Mini Messages, Paper Smooches - We totally Click. I hope everyone had a fabulous holiday season. 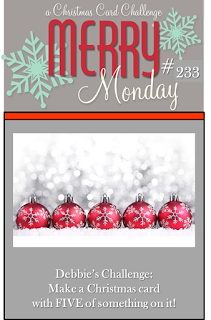 We are back with a new Merry Monday Christmas Card Challenge. Sue is our hostess this week and the challenge... Make a Christmas card with angels on it. I don't have any angel stamps in my stash, and a little laugh for you. I had this little gal coloured and fussy cut out before I realized her arms.. are not wings. Ha. I was not willing to give up so soon. I pulled out a butterfly die cut and created her a set. I coloured her with my Spica glitter markers then gave her a healthy coat of Wink of Stella to give her otherworldly look. I added a simple sentiment and finished with some sequins. 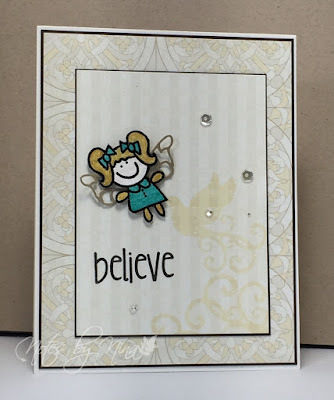 Supplies: Cream and brown cardstock, Designer Paper - Authentique, The Alley Way Stamps - Toyland and Christmas Magic, Memory Box die cut, sequins. Happy New Year, I have a quick post for the first one of 2017. I was asked for a Birthday card for early January. Being as it is for a coffee shop owner I could not resist a coffee themed card. I stamped, die cut and coloured too coffee cups. 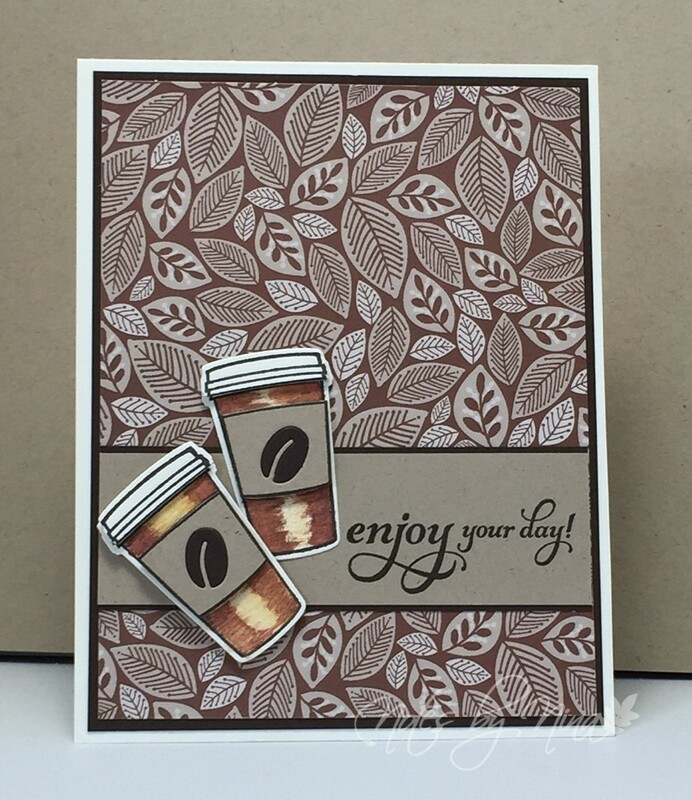 I used due cuts from the same set for the sleeve and coffee bean. The background is a piece of scrap that was just the right side. I added a sentiment to another scrap for kraft cardstock. Supplies: Brown and cream cardstock, DP - Unknown, Taylored Expressions - Joe-to Go, Penny Bkack - Heartfelt.